HUDSON, MA (May 16, 2017) – Facilis Technology, a leading international supplier of cost-effective, high performance shared storage solutions for collaborative media production networks, has announced the successful installation of a large-scale shared storage solution at leading German TV production service providers, nobeo GmbH. Working closely with local channel partner, Cologne-based Speed Systems, Facilis has installed three TerraBlock 24EX/16 and TerraBlock TX16 expandable storage systems together with a TerraBlock Hybrid24 storage system. All the TerraBlocks are connected to a switched 10 Gbit/s ingest and logging network and to an 8Gbps Fibre Channel editing network that supports the entire seven studio, outside area and post production campus where they manage all ingest, logging, service and back-up operations. 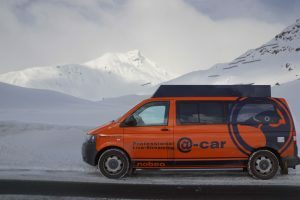 Working for some of Europe’s leading broadcasters and content creators, such as Endemol Shine Germany GmbH, UFA Show & Factual GmbH, Filmpool entertainment GmbH, RedSeven Entertainment GmbH and Norddeich TV, nobeo has invested in an extensive and specialized production infrastructure. The facility operates an Avid infrastructure comprising 80 Media Composer edit systems and six ProTool HD edit suites. A central feature of Facilis TerraBlock is the collaborative operating practices that it facilitiates – a feature that Ende describes as “must have” within Avid workflows. “Already we can recognise the very fast behaviour of the Facilis system and how it provides large, highly cost-effective amounts of storage – it is straightforward to expand our network with cheaper Ethernet 1 or 10 Gbit clients for logging and ingesting tasks. “With Facilis, I like how easy it is to expand our storage network, simply by adding an additional server and not having to concern ourselves with issues such as managing servers, databases or client licensing,” Norman Ende concluded. nobeo GmbH is a full service provider of TV production services based in Hürth, just a stone’s throw from Cologne. Situated close to the media metropolis Cologne, the studio complex offers an ideal production environment for TV and web TV productions. Seven studios, an extensive post production unit, a blue box and an open air area altogether provide the perfect setting for complex live shows, dramas and international programmes. With mobile HD production sets nobeo can support TV productions at literally any location. 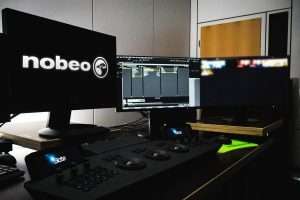 nobeo1, one of Europe’s most modern OB trucks, provides the heartbeat of numerous outside productions. Ever since 2007, nobeo has been part of the Euro Media Group, enabling it to operate on a global scale. 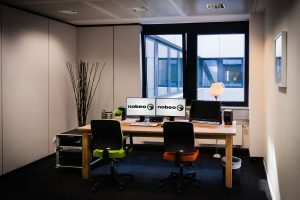 As part of this international partnership, nobeo acts as an interdisciplinary media centre and not only provides classic TV production services, but also solutions for video-on-demand or over-the-top systems. nobeo provides clients with a broad diversity of professional, interdisciplinary expertise and a pool of highly specialised equipment.